(Nanowerk Spotlight) Two-dimensional (2D) materials like graphene and molybdenum disulfide (MoS2) are known to have unique properties. The family of 2D structures with a wide range of chemistries can open the door for better understanding of differences between properties of 2D and 3D materials; lead to identification of useful properties of 2-D carbides, nitrides, oxycarbides and other related structures; and ultimately result in new applications. A recent study ("Two-Dimensional, Ordered, Double Transition Metals Carbides (MXenes)") has shown that the family of 2D materials, in particular MXenes (read more about MXenes in our previous Nanowerk Spotlight), can be greatly expanded based on a new 'double metal' strategy. With these 2D systems complementing other nanostructures, a diverse array of well-defined nanostructured materials has now become available to allow researchers to focus more on scaling up the syntheses of these nanoscale building blocks, and studying them in bulk forms rather than as individual units. This scaling up of nanomaterials in the broader context of materials science and engineering is the topic of a Perspective article in ACS Nano ("Bulk Nanostructured Materials Based on Two-Dimensional Building Blocks: A Roadmap"), where the authors construct a roadmap for assembling nanoscale building blocks into bulk nanostructured materials, and define some of the critical challenges and goals. As the authors write, 2D sheets are uniquely well-suited in this roadmap for constructing dense, bulk-sized samples with scalable material performance or interesting emergent properties. But no matter what structures are used, "when nanostructures with better-than-bulk material performances are used in bulk form, it is critical that those extraordinary nanoscale properties can be scaled to the macroscopic level." A good example is the challenge to scale up the properties of carbon nanotubes (CNTs) to the macroscale. Materials engineers are keen to exploit the outstanding mechanical properties of CNTs for applications in fibers, composites, fabrics and other larger-scale structures and devices all the way to futuristic applications like a space elevator. The ability to fabricate continuous, multifunctional yarns represents an important step in this direction (read more: "Spinning kilometers-long, multi-layered carbon nanotube yarns"). 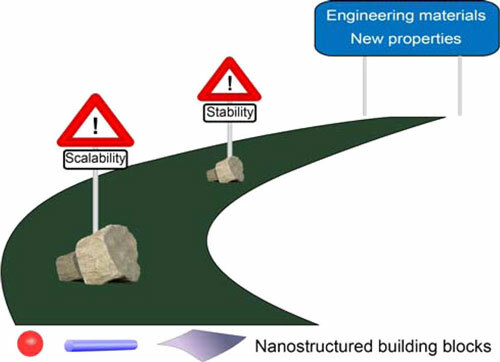 With regard to defining a roadmap for the bottom-up assembly toward new bulk nanostructured materials, the authors point out that there are a number of challenges, which can be summarized as scalability and stability. 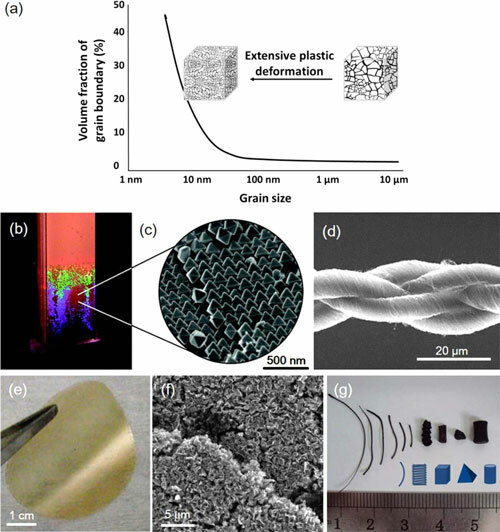 "Scalability refers to both scalable synthesis of high-quality processable nanoscale building blocks, and scalable material performance, where the properties of the nanoscale units are still accessible in the final bulk pieces. Stability of the building blocks is also important, because they should not sinter into large grains or chemically transform into less useful materials during processing or application." The authors conclude that 2D materials are probably the most promising group of well-defined nanoscale building blocks for constructing bulk nanostructured engineering materials: "2D sheets are capable of forming intimate face-to-face contact, and they can bend, wrinkle, or crumple during assembly. Some can even plastically deform at the single layer level. Therefore, they can construct high-density bulk samples with tunable free volumes and porosities. In terms of stability, if the parent layered materials are thermodynamically stable, then we might expect the exfoliated 2D sheets to be sintering-resistant and capable of maintaining their single- or few-layer thickness. However, their high surface area also leads to higher chemical reactivity than in bulk materials, which should be addressed for target applications. Proper encapsulation or surface passivation could help to mitigate this problem without sacrificing performance."